Medal of Valor | W.S.P.C.A. 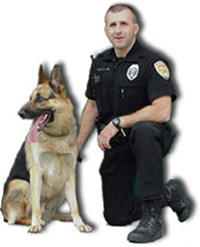 On March 24, 2003, at approximately 10:30 pm, Officer Chip Higinbotham and his partner K-9 Ikon were involved in the pursuit of a wanted felon in the Silver Lake area. The suspect, a 33-year-old Everett man, was stopped for a traffic violation. Officers discovered that the suspect was wanted for an outstanding felony warrant for a Violation of the Uniform Controlled Substance Act, a narcotics violation. The suspect fled from officers on foot. A foot pursuit began from the 900 block of Peters Place. Ikon and Officer Higinbotham tracked the suspect on a circuitous route through the Silver Lake Neighborhood to Interstate 5 near 112th Street, closing the distance on the suspect. Officer Higinbotham released Ikon to track through some thick underbrush. The suspect fled across Interstate 5, with Ikon tracking him. Ikon caught up to and contacted the suspect. A witness observed the suspect fighting with Ikon on I-5. A passing motorist struck the K-9, who was gravely injured, and the suspect escaped on foot. The motorist did not stop after the accident. Officers transported Ikon to a veterinary clinic where he died from his injuries at around midnight. On the morning of March 25th officers continued the search for the suspect and located him at a residence in the 900 block of Peters Place. The suspect had K-9 contact injuries on him. The suspect was booked into the County Jail for the Arrest Warrant. 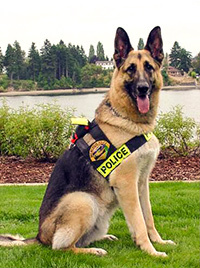 Ikon served the Everett Police Department for 5 years and was a deeply loved member of the Everett Police department. He was an 8-year-old German Shepherd police dog that had been obtained by the department through the Vancouver Police Department in Vancouver Canada. 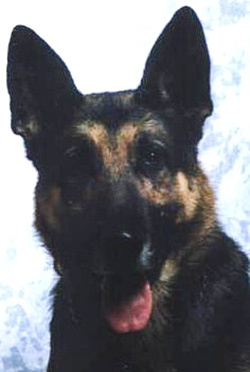 Ikon, like all Everett Police K-9s, served with great distinction and courage throughout his career with the department. Ikon was an integral part of Officer Higinbotham’s family throughout his career, living at the home of the officer during off duty hours. Officer Higinbotham and Ikon were committed to community involvement providing demonstrations for a large number of community groups over his career. Ikon will be greatly missed by our community. Ferro was accidentally killed after being struck by a police car. Ferro was sent by his handler on a direct apprehension of a suspect running across five lane highway. Another responding officer accidentally struck Ferro while driving into the scene to assist. Ferro worked as a member of the Pierce County Sheriff’s Office for almost four years. 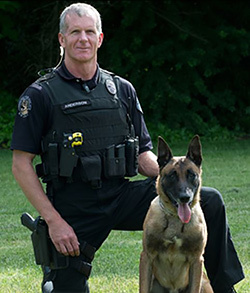 K-9 Buddy, a Bremerton Police dog on the force just three months, was shot and killed while trying to apprehend a suspect at Lions Playfield in East Bremerton early Monday morning. Buddy’s handler, Officer Mike Davis, returned fire and critically wounded the man. Responding to a report of gunshots in the park about 1:45 a.m., Bremerton Police officers saw two men hiding in the bushes near the boat launch at the north end of the park, according to Bremerton Police Detective Wendy Davis. The two men ran, and Officer Mike Davis with Buddy tried to arrest them near the playground. One of the men shot Buddy in the head and then fired at least one shot toward Davis. Davis returned fire, hitting the man in the abdomen. The suspect was listed in critical condition at Harrison Memorial Hospital. The second suspect was arrested after a Kitsap County canine unit tracked him to an apartment about two blocks away. Within a few hours, notes and calls of sympathy were pouring into Bremerton city hall. One unidentified woman dropped off a half-dozen red roses at the scene of the shooting with this note: “So sorry for the loss of K-9 Buddy. Our thoughts and prayers are with his handlers and his family.” Officer Matt Smalley, who accepted the flowers, said people can relate to losing an animal they feel close to. Wendy Davis said the two suspects were known to police. The semi-automatic pistol used to shoot the dog has been traced to a burglary in Port Orchard. hierkhan, a German shepherd who was a working member of the Seattle Police Department, was killed – hit by a car – in the line of duty. Shierkhan’s was a respected, yet short, career. In almost three years, the dog was involved in more than 80 drug arrests. “His life has been in danger before,” said Pam McCammon, spokeswoman for the department. At about 9 p.m. Friday, Lewis and Shierkhan were called to 10th Avenue South and South Dearborn Street, underneath Interstate 5, to track two carjacking suspects. Shierkhan found the victim’s purse, caught the scent, and began to track the suspects. Lewis had ordered a section of road closed to traffic for the search. It’s not clear why there were still cars on the road, but the dog was struck. Lewis stood only a few feet away. He held the dog in his arms while another officer drove them to the veterinarian’s office, where “people in the lobby were crying for him,” said Sgt. Carol Minakami, the canine unit’s supervisor. 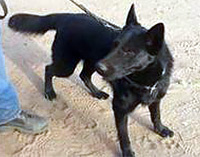 Lewis and Shierkhan were “the leading force” in the canine unit, Minakami said. They loved to do demonstrations at grade schools, nursing homes and charity auctions. “It’s amazing what they do,” Minakami said of the dogs. “It’s dark and you go through back yards and over fences and through creeks and blackberries and up hills. 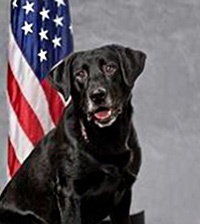 On February 13th, 2000, Blesk, a Spokane Police Department patrol dog, was accidentally shot and killed during a SWAT raid. Blesk’s handler was PFC Tom Stanton. LYNNWOOD – Moments after capturing an alleged drug dealer who tried to flee authorities Tuesday night, a Snohomish County sheriff’s K-9 dog wandered into freeway traffic and was struck and killed. Now deputies are trying to determine if the suspect they arrested hurt the 3-year-old German shepherd named Recon, causing the dog to become confused. The incident happened between 6:30 and 7:30 p.m. on I-5 near 44th Street in Lynnwood.Recon and his handler, sheriff’s deputy Jim Gibson, were assisting the Snohomish Regional Narcotics Task Force in a drug bust at a nearby park-and-ride lot when the suspect broke loose. The suspect, an Alaska man, ran off, climbed a 7-foot fence and crossed six lanes of freeway traffic, before the dog was able to catch and stop him.Gibson, arrived a short time later and called the 3-year-old dog away from the man. “(Recon) just looked like he was dazed… like I’ve never seen him before,” Gibson said, adding he thinks his partner may have been choked before roaming into traffic. It is a felony to assault a law enforcement officer – that includes a police dog. The woman driver who struck Recon is very upset too, Bart said. She was driving at normal freeway speeds, but there was nothing she could have done to avoid the accident, he said, adding he’s glad she wasn’t injured. The suspect was treated at Stevens Hospital in Edmonds for minor dog bite wounds and booked into the Snohomish County Jail for investigation of delivery of a controlled substance and several outstanding warrants, said sheriff’s Lt. Dan Howard. Authorities confiscated approximately 1 kilo of cocaine. The suspect allegedly flew in from Alaska to make the delivery at the park-and-ride lot, where he was met by authorities, Howard said. K9 Bolo was just seven months into his career after having passed acreditation. We got dispatched to a robbery of a McDonalds that had just occurred, and found the suspect vehicle in front of us. A pursuit of approximately one mile ensued, and the driver went into a cul-de-sac. As the suspect vehicle tried to escape, an unmarked car blocked his escape route, causing a collision. The driver suffered a broken leg, and the other two suspects fled. Bo took chase and was less than 40 yards behind them as they went into the woods. Seconds later, a single gun shot rang out. Skagit County Deputy Keith Brown and K9 Eso were arriving, as one suspect exited the other side of the woods directly in front of him. Eso apprehended the suspect, and then joined in the search for Bolo. Eso located Bolo 50 yards into the woods. During the evacuation of Bolo, Eso dissappeared twice and had to be recalled. Eso had made contact with the second suspect twice, which was learned later during interviews. K9 Bolo received a single gun shut wound through his shoulder, nicking the spine, leaving him partially paralized. He underwent surgery and rehab. He returned to work 5 months later, but was retired after failing agility testing. 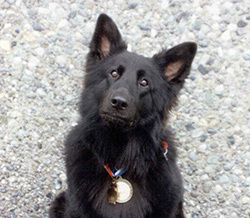 Bolo was awarded the Washington State Police Canine Association Medal of Valor, MVPD Distinguised Service Award, and the National Service Dog Award at the AKC German Shepherd Nationals in Perry Georgia. Bolo lived out his retirement continuing to make appearances at schools and talks about Police K9’s. His physical problems finally caught up with in in January of 2000. He was 11 years old. 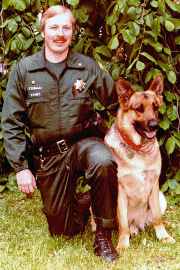 In May of 1990 Deputy Tom Mitchum and K9 Lucky responded to a shots fired call. A suspect had fled from a stolen vehicle and subsequently fired at pursuing officers. K9 Lucky was put on the track and tracked through the bush. As Lucky indicated they were getting close to the suspect he entered a heavy bush area and got out of sight of the handler. Moments later Deputy Mitchum and his backup officer heard a large caliber gunshot from the ridge above them. The officer felt that his dog was down and injured, if not killed. Darkness was nearing and more units closed in on the area. A plainclothes member doing containment reported via radio that he was holding a suspect at gunpoint. The suspect was in possession of a .357 magnum revolver and a .22 caliber semi-auto handgun. The man admitted to shooting a dog and gave directions where the dog could be located. Deputy Mitchum and assisting officers went back to the scene and found Lucky dead from a single gunshot wound to the chest. Autopsy reports indicate that K9 Lucky was in full charge when shot by the gunman. Lucky was in service since 1987, credited in 1988 with 46 felony and 97 misdemeanor arrests. In 1989 he had 112 felony and 99 misdemeanor arrests. Prior to his death in 1990 he was responsible for 20 felony and 41 misdemeanor arrests. 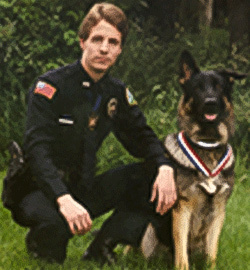 Bellingham Police Officer Dave Doll and K9 Zeke began working as K-9 partners in 1989. They had been working only a few months when an incident occurred that would forever change the two of them. In October of 1989, Zeke and David responded to a man with a gun call in the downtown area. During the incident, Zeke was shot by the suspect and seriously injured. He went on to recover and went back to work before he received a well deserved early retirement in 1990. Zeke received the Medal of Valor for his actions that night. He is the only police dog in the history of the Bellingham Police Department to receive this honor. Without a doubt, Zeke’s actions that night kept other officers from injury. Zeke passed away in March of 2000. K-9 Zeke, a 121 pound black German Shepard with the Tacoma K-9 Unit, died 19 hours after successfully tracking Troy Douglas Johnson, a domestic violence suspect. A Sergeant at the scene reported that once Zeke appeared to have caught Johnson, the dog began to yelp, limped into a street, and lay down bleeding. Yuhasz went to the aid of the dog which had a deep puncture wound to it’s shoulder. Two officers eventually apprehended Johnson, but first he threatened the officers by waving a knife toward them when they got close. When he refused to drop the weapon, officers there with night sticks struck him several times in the arms and legs. The blows had no apparent affect, and one of the officers then struck Johnson once in the head with a baton and he dropped the knife. In 1986, Zeke hadn’t even been on the force for a year when Yuhasz was struggling with an assault suspect near the edge of a cliff. The suspect was trying to push Yuhasz over the edge, but Zeke knocked the suspect to the ground to save Yuhasz. When he appeared in court Tuesday, Johnson arm and face where badly scratched and his head was stitched above his hairline. On July 6, 1988, at 1900 hours, police units from King County’s Southwest Precinct (Sea-Tac area) were dispatched to a forgery investigation at the Marriott Hotel located near the Sea-Tac Airport. As officers arrived, the suspect saw them and fled on foot to a waiting vehicle with a seventeen year old female inside. The suspect took off at high speed in a stolen BMW and a pursuit ensued. The pursuit lasted five minutes and ended when the suspect mistakenly took a wrong turn into the parking lot of a Washington State Patrol office. He and the female fled on foot. Troopers saw the female hand a small black object to the male suspect, later discovered to be a .25 caliber semi-automatic pistol. The female was caught by one of the troopers and another trooper chased the male suspect into a very heavily wooded and brushy ravine where he lost sight of the suspect. A tight perimeter was set and a K-9 unit was requested. Dpty. R. Gehrke and Police Dog Zach responded to the scene with a 20 minute response time. The police dispatcher broadcast that the suspect was probably armed although no weapon was seen. Ofcr. Gehrke made contact with Sgt. T. Oswald, the last person to see where the suspect went over a fence into the woods. Both Ofcr. Gehrke and Sgt. Oswald went on the track after Zach was put over the eight foot cyclone fence. Before Zach was put over the fence, he was air scenting so the officers knew the suspect was fairly close. Once over the fence, he immediately picked up a track along the fence line for about fifty yards, then tracked down into a very thick blackberry ravine where he engaged the suspect. At this point, Zach was tracking off line and could not be seen, but there was movement in the dense brush about thirty feet ahead of the officers. Five shots were heard in rapid succession fired by the suspect, with Zach making a muffled yelp on the third round fired. Ofcr. Gehrke and Sgt. Oswald were only twenty feet from the scene and took cover by diving into the brush behind a large tree. Gehrke tried to recall Zach once but he did not respond. Since they were only twenty-five feet away from the suspect, only one recall was voiced to prevent giving away their location. Realizing his dog was likey shot, Gehrke requested three additional K-9 teams to respond. He wanted two handlers with a fresh dog to run with him and he wanted one team to prepare as a transport vehicle to take K-9 Zach to Greenlake clinic. K-9 Officers Bell and Klason arrived with Police Service Dog Magnum fifteen minutes later. Gehrke took them to where he had last seen Zach and K-9 Magnum immediately began to air scent. He located the suspect lying down just ten feet on the other side of a brush pile. K-9 Zach was laying next to the suspect and both the dog and the suspect had obvious head wounds. Zach was carried out by Oswald and Gehrke to other K-9 officers and CPR was immediately initiated. Instructions were given over the radio by Department veterinarian Dr. Canfield to a Medic Unit that arrived to assist. They were trying to stabilize Zach for transport to Greenlake Animal Hospital, however there was no heartbeat or respiration. At the hospital Dr. Canfield performed necessary measures but pronounced Zach dead on arrival. Zach was shot four times in the head with two bullets entering through his mouth. Dr. Canfield stated that any one of the head wounds would have been instantly fatal. The suspect was taken to Harborview where he died a short time later of a self-inflicted bullet wound to the head. Zach was awarded with King County’s Valor and Blue Star Awards for unselfishly giving his life in the line of duty for his fellow officers. He was born on December 9, 1982 and was sired by King County Police Dog Jake. Jake was shot by a bank robber, once in the chest and once in the head with a .357 magnum, but survived his wounds to go on and live peaceably in retirement after 6 years of service. 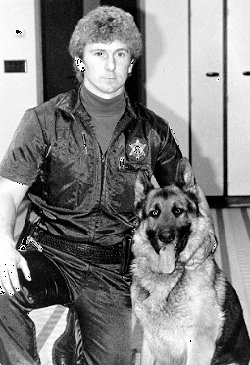 On October 15, 1985 at about 0046 hours, while on the track of a suspect fleeing from a burglary of a local high school, K9 Ward died as a result of a single stab wound to the chest. An 18 year old white male suspect was apprehended one hour later in the area armed with a handgun and a knife. Ward, handled by Deputy John McCroskey, was a five year old German Shepherd. He had been with the Sheriff’s office for about ten months and in that time was involved in thirty-five to forty felony arrests. Police Dog Ryker, a 6-year old German Shepherd, was struck by a vehicle at 40th and Portland Avenue at approximately 7:30 p.m. the evening of December 26, 1982. He died 40 minutes later at a local veterinary hospital from the injuries he sustained. Ryker and his handler, Det. Bruce Jackson, were responding to the robbery of the Dairy Dell at 4010 Portland Avenue which occurred at 7:20 p.m. The suspect was an armed Indian male. Ryker obtained a good scent and was tracking the suspect when he was struck by a car at the intersection of 40th and Portland Avenue. The driver of the car, who was not cited, said he did not see him. 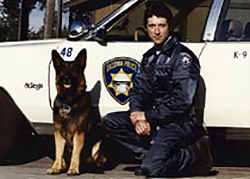 Ryker was commissioned on April 23, 1982 and assigned to the K-9 Unit of the Patrol Division with his handler, Det. Bruce Jackson. 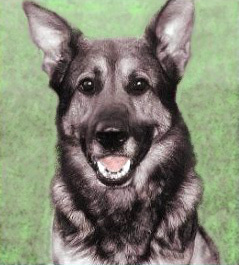 Ryker was Tacoma Police Department’s first police dog. Ryker and his handler were credited with more than 50 felony apprehensions and an additional 30 misdemeanor arrests in his short tenure with the department.